Supportive Living communities offer the "Missing Piece" of affordability to seniors and their families. The 4 C's of Supportive Living are Care, Compassion, Comfort and Cost. Pinnacle Place hosted an Open House on Wednesday, April 27. Guests enjoyed a tour and a chance to win some great door prizes. The Pinnacle Place Newsletter is available online. 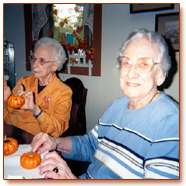 Find out about all of the events happening at Pinnacle Place, important information about healthy senior living, a tasty recipe or two, some interesting trivia tidbits and silly jokes to tickle your funny bone! Here's the latest monthly issue. Pinnacle Place now has a Skype account and our residents can make voice and video calls for free over the internet. If you would like to contact your family member at Pinnacle Place through Skype, contact JoEllen to add you to our contacts list. AOA Optometrics recommend senior citizens wear quality sunglasses and wide-brimmed hats year-round to prevent eye damage from exposure to ultraviolet (UV) radiation. Sunglasses and hats would be great gifts for birthdays or Christmas. Savanna's Beta Sigma Phi Sorority sponsored and Ice Cream Social at Pinnacle Place. We enjoyed ice cream cake, root beer and conversation. Pinnacle Place residents created fireworks on cards by smashing flower petals with hammers for color. 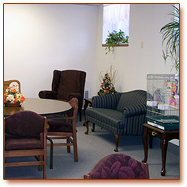 The cards were signed by all the tenants and staff and sent to family members in the military. 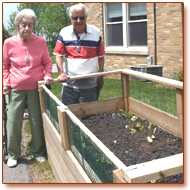 Pinnacle Place residents enjoy gardening with our stand-up garden and topsy turvey planter.